It was one of those trips to Target, where I'm nearing the checkout near the cosmetics, and I spot a pretty polish. 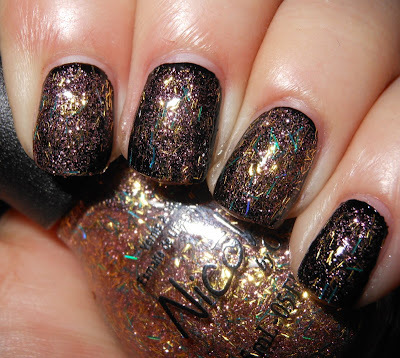 This time it was Nicole by OPI A Gold Winter's Night which is part of the Kardashian Holiday collection. As I got closer I realized this was a bar glitter. I'm not really a bar glitter fan at all, unless it's those teeny tiny ones that are mixed in glitter bombs. This was so sparkly and pretty though that I could resist. I know I can hear the bar glitter haters screams of horror already, but I actually like this one! A Gold Winter's Night is a mixture of a micro rose glitter, blue iridescent bar glitters, and gold bar glitters in a clear base. What I like about this A Gold Winter's Night is it's not your stereotypical holiday polish. Honestly, as much I love Christmas colors, I do not want to wear them all the time in December. This is glitzy, sparkly, and totally reads holiday season without it being the obligatory red and green. It's really girly too, which I would expect coming from a Kardashian collection. I love this combination of colors. Blue, gold, and pink is definitely unexpected but work well together! I used 2 coats over the base polishes here. I personally do not find glitters like this wearable on their own. 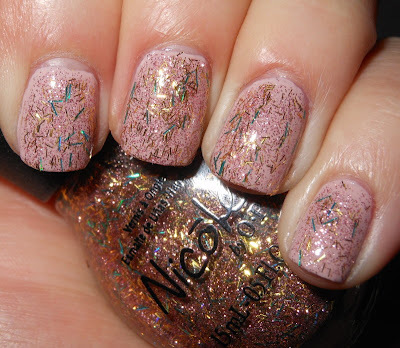 While, it can build up, since there are varying sizes of glitter you will not get 100% coverage. There will be bald spots, so I recommend layering. The formula was easy to work with, but I'm not a fan of the wide brush. *Can I just add how much I hate NOPI bottles. They are are impossible to hold properly. As you can see my pinkys are unfocused because of the stupid bottle shape. Grawr. I'm personally not a fan of bar glitter, but the polish is still cute. Definitely pretty! Now I wish I hadn't passed on it when I saw it. Love it over both bases! This was the only Kardashian Christmas polish I grabbed but it is so pretty! I don't loathe bar glitter but I don't love it. The colors and sparkle were just calling me! I think the bar glitter looks like a finer shred than normal bar glitter. Maybe I'm seeing things. And I despise the NOPI bottle. I have only a couple Nicole by OPI purely because I hate storing those awkwardly shaped bottles! I think this is better over dark colors. I will have to check out the collection. But I am more interested in the Revlon holiday collection. Glitters I can get behind. I had a really rare trip into a Target (think it's only then 2nd time in 1 yr) - saw this one - did a little dab of it on the sheet of clean white paper I always keep in my purse so I can use it for just these kind of things...I did not pick this one up because I did not like the bar glitter that I thought was too thin - reminds me of lint when it's this kind of bar glitter. And yes, I am with you on being one of those NOPI bottle hatters...have hated them since they first were in really limited release in the want to say early 90's - they were not released often and it was at first I think going to be just a short term thing. You used to get a token from buying one from the retailer and put the token into this box by the NOPI Polishes - there was something that was donated based on sales but I don't recall what it was for. But I hated the bottles then and still do! It's not so much they are hard to hold but they are huge hogs for space in my stash and no matter how I have stored my polishes they always are a huge burden - to the point I really don't like to buy the often and I try not to get big old lemmings for them...this has been going on pre Internet days so it's always been an issue - you would have thought knowing so many folks did not like the bottle shape they would have changed it long ago. I did not pick up any of the Kardashian Kolors for holiday 2012 - I looked carefully at one that looked like a silver version of fall's Busta Mava - same complex speckling of colors in it only it was in a silver base with pinky red and some other shades vs the brownish mauve that Busta Mava (and whatever that green one from the fall collection was called - it was the same sort of formulation - tons of color specs with one of them ending up as the predominate shade.